Properties in Solna average 4.3 out of 5 stars. Property 31: Wonderful turn of the century apartment in prime location. Property 41: Close to Stockholm, outdoor pool and sea. 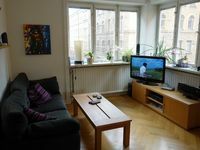 Property 49: Welcome to a topstandard apartment next to the famouse Hornsberg Riviera! 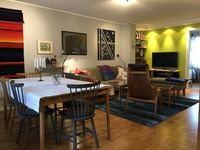 Brilliant location in a fabulous part of Stockholm! We were very happy with our stay. The apartment was comfortable and light filled and very close to bus and train. Fantastic cafes and restaurants are close by and interesting clothes and homewares boutiques. Great second hand shops too. Easy to get to the old town and central Stockholm by train or bus. Our hosts were very helpful with all our questions. Highly recommend!